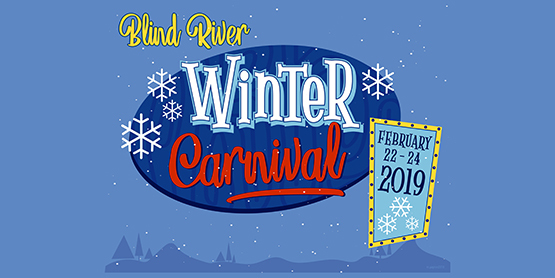 Blind River Winter Carnival is a fun filled family weekend, that highlights our winter facilities. Experience curling at the Blind River Curling Club, as they host Family Learn to Curl sessions, a curling One on One Challenge, food and music. Saturday is packed full with events; Pancake breakfast, cupcake decorating, sliding hill, tour the snowman village, horse drawn sleigh rides, kids ice fishing derby, Timber Village Museum Selfie Challenge, hockey games, public skating, spaghetti dinner and a concert by Mark Tarantini. Sunday begins at the beautiful Boom Camp Trails, where the Blind River Cross Country Ski Club hosts a good old fashion Ski Loppet, free skiing and a variety of children’s activities. The weekend ends, as the Blind River Beavers challenge the Kirkland Lake Gold Miners to a Junior A hockey game. Please visit our website at www.blindriver.ca for complete event listings and times.